A simple fix that edits the area added by Far Harbor to not conflict with Beyond the Borders by thelonewarrior. 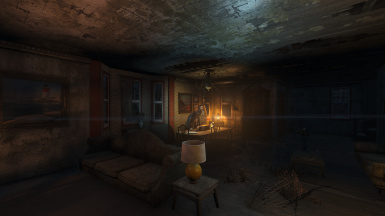 Permission is needed from Thelonewarrior found - http://www.nexusmods.com/fallout4/users/2475748/? I made mostly for my own use that fixes Beyond the Borders to make it compatible with Far Harbor. I removed the land that clipped into the Nakano house, removed a rock that covered several doors at the Zoo, removed some rubble that blocked the farm at the Overpass and removed the fence that runs through the Red Rocket. The area around the Nakano house is going to look a little bit funky and I am sorry for that. The bank building in Balmera also had to be removed and the door moved slightly. This is not supposed to be a fix for any crashing that might occur with Far Harbor as I personally do not have that issue. This is only supposed to fix the areas that Far Harbor makes inaccessible along with the Nakano house. There is still some minor clipping around the Nakanos shed(where you pick up the reward for finding Kasumi) and the boathouse(with the safe that has Kasumis holotape) but as it doesn't block anything I have left that alone. I am still learning how to use the Creation Kit but the area should at least be accessible in its entirety. If I miss something please don't hesitate to mention it and I will try and fix it for the next version. Known bug- The Balmera Bank door is not attached to anything because the building covered up the Nakanos shed. I know this but I am not sure how to actually move the door in game because in the Creation Kit it shows up where I want it to be. Credit goes to thelonewarrior and the rest of the Beyond the Borders team who allowed me to upload this edit.